Shrink PDF for free - Efficiently reduce PDF file sizes! The easiest way to shrink a PDF is with our PDF Printer 7-PDF Printer. Because sometimes PDF files can be too big to send in an email. It also saves disk space when saving PDF files on your hard disk space in terms of file size. Who does not know that, a PDF file is several megabytes in size and the email server of the recipient refuses to accept the giant email that has just been sent. The sending of an oversized PDF file is usually followed by an error message from the eMail server. This costs time and nerves. But how can you optimize and reduce a PDF file in terms of file size so that, the quality does not suffer in printout and display? 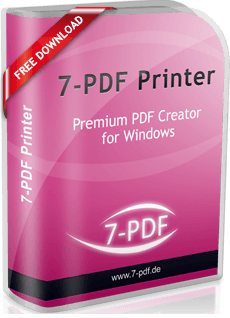 For this purpose, we have equipped our PDF Printer "7-PDF Printer" with predefined quality and compression methods, which are easily made available via the print dialog when reprinting an existing PDF file. 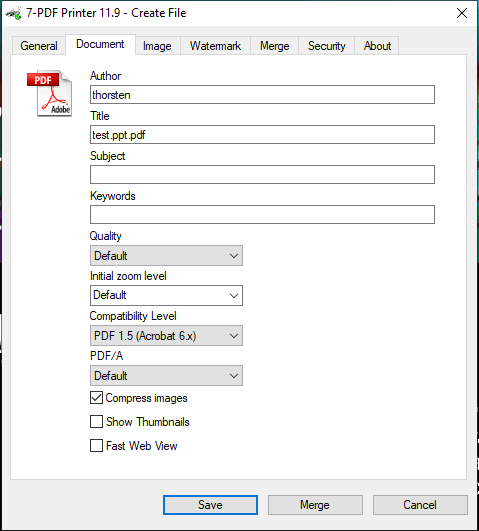 In this way, you can easily create optimized, smaller PDF files from existing PDF files that have been automatically optimized for the respective application! As already described above, we open an existing PDF file with a PDF viewer such as the free Acrobat Reader. We used a PDF that was originally from a 68-page Powerpoint presentation saved on Windows 10 using the Microsoft Print to PDF printer. 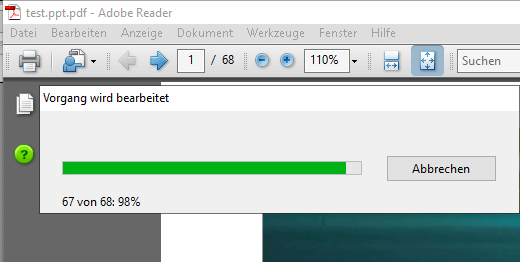 The PDF file "test.ppt.pdf" already has a decent file size of 5.624 KB. 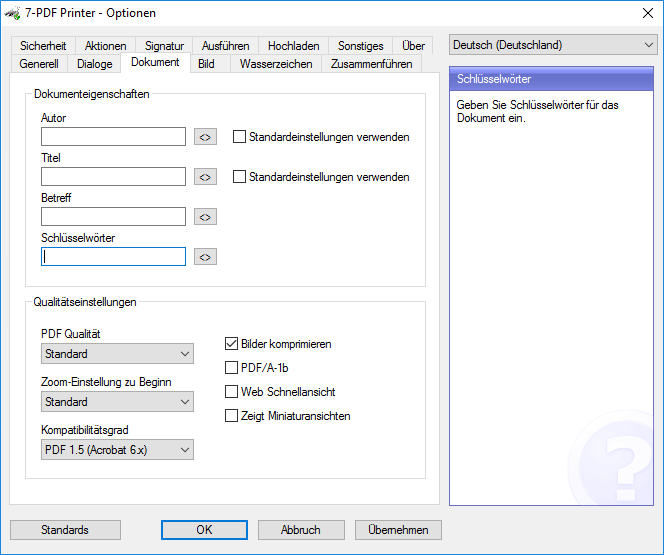 However, with the "Standard" settings of our PDF printer "7-PDF Printer", we are able to reduce the size of the PDF to 4.799 KB by re-printing via 7-PDF Printer (see test.pdf). This already equates to reducing the PDF file size by almost 15%. Illustration: The compressed PDF file test.pdf is 15% smaller than the original! 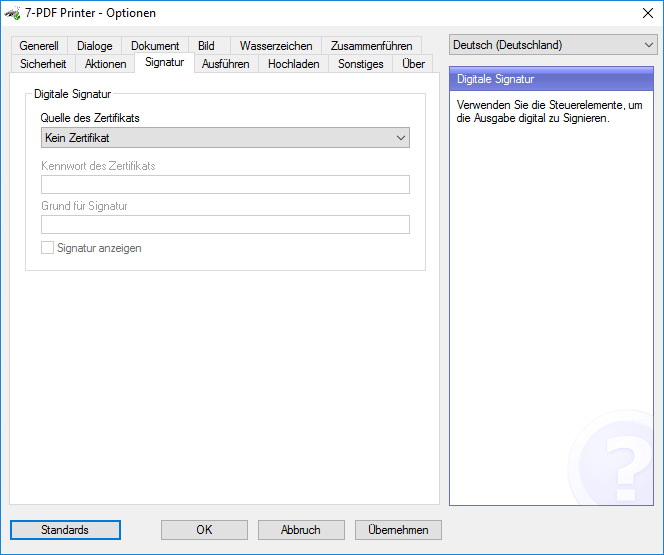 But we get this even better, because now we use the quality setting "Screen" in the print dialog box of our PDF printer. The now generated PDF is only 2.485 KB in size and still in good quality. The original size of the PDF file is now a reduction of the PDF file size by a whopping 55%! Illustration: The compressed PDF file test.pdf has shrunk by 55% compared to the original PDF! 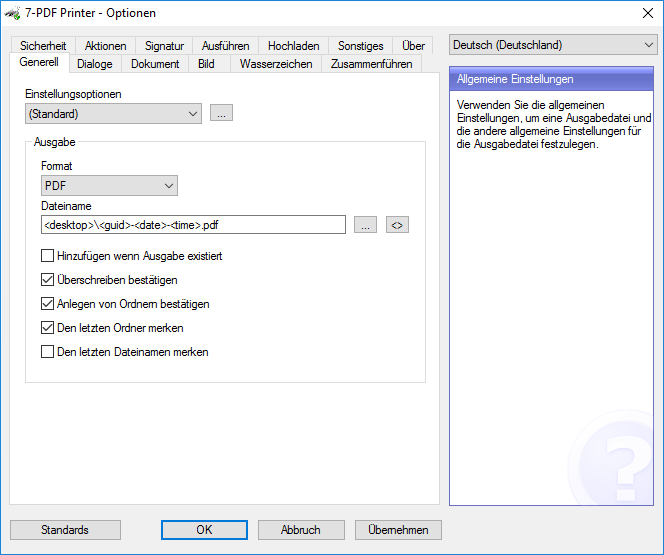 So reducing PDF files does not have to be complicated, and above all not difficult. Installing the proper PDF Printer on your system saves you space and leaves you "nervous" when sending avoid PDF files. Automate PDF automatically with advanced, professional compression technology! Our PDF printer compresses PDF content optimally so that savings in file sizes of PDF files of more than 55% are possible. Optimized for sending PDF files via email or web for example when creating PDF safety data sheets, PDF user manuals for online shops. Especially in the eCommerce area every saved byte counts. Users expect a fast download provided PDF files and this is usually only possible by optimizing existing PDF files. Reduce and optimize PDF in file sizes for Web, Mobile and eCommerce is very efficient with our PDF Printer and can even be completely automated. Whether from own applications, or like in a batch processing, or by means of COM developer PDF API from own applications out. 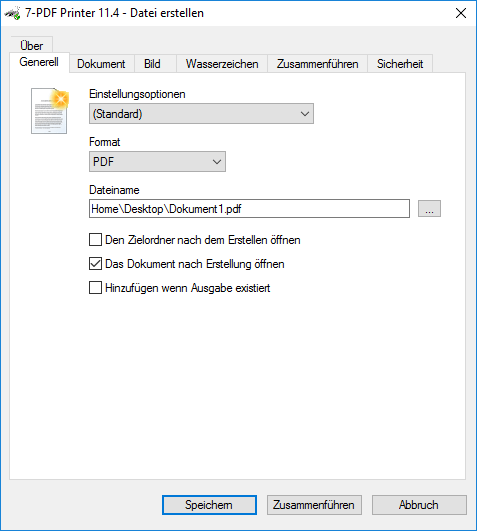 Shrink PDF using CommandLine, COM PDF API or in batch mode! The possibilities to automate our PDF Printer are very extensive. Whether you are a developer or system administrator looking for solutions to shrink PDF files and to optimize them for your requirements. 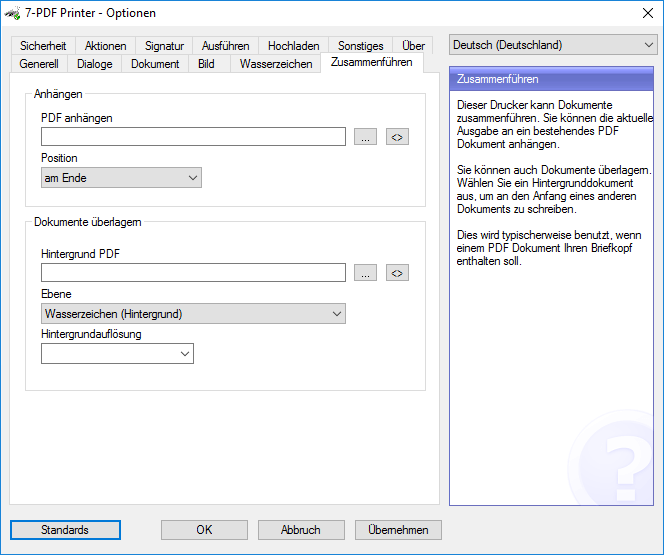 We have already developed the right PDF tool for you, and make it well documented to all interested parties at 7-PDF.de available. Take a look at the extensive online documentation section of our PDF printer get back to first use cases and code samples, and benefit from our sophisticated PDF Printer Technology directly on your own systems! Cope with your requirements with Citrix, Terminal Servers, PCs & Co. with our software! Everything from one source, everything in english language for medium-sized businesses, corporations and small businesses as well as professional end users.